This is "Statistics" page in EurekaLog project's options. This page displays stats about last project build. This is optional page. It is displayed only when viewing/editing project options in IDE. It will be hided if no project is opened or when viewing/editing options in standalone Settings Editor tool. Note: the stats are not collected by default. 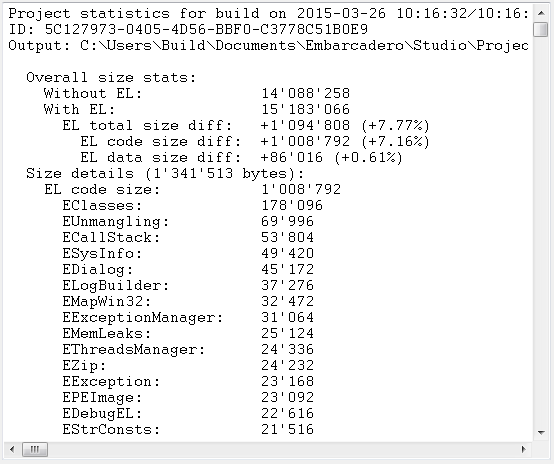 Additionally, the stats are not saved when project is closed. You have to enable stats collection and rebuild the project to view stats: enable stats collection by checking "Calculate stats" option (and, optionally, "Debug output" option) at "General" page. Then rebuild the project and view "Statistics" page.